Pro Data Doctor Digital Pictures Recovery software recovers and unerase lost, deleted and formatted digital photographs, pictures, still images, snapshots and other files/folders from the corrupt hard disk and USB flash removable media drives. Photo recovery software easily works with every type of digital card reader appearing as disk drive on your Computer PCs. The undelete software easily recovers lost digital photos, images and other files from all major branded hard drives and removable media drives. This award-winning picture recovery software easily and quickly recovers precious lost memories. The advanced uneraser recovery technology makes photo recovery reliable solution for photo, pictures or digital image recovery. The award winning digital picture recovery software support all major branded hard disk drive including Samsung, Toshiba, Sony, Western Digital, Maxtor, Hitachi and other USB flash removable media including Compact Flash, Memory Stick (Pro and Duo), Mini SD, Multimedia Card, MMC, SD Card, Smart Media, XD Picture Card, PDA, Micro Drive and more of Nikon, Kodak, Konica-Minolta, Panasonic, Toshiba, Canon, HP, Sony, Olympus other popular manufactures. Get back all types of image files including jpg, jpeg, gif etc. Support all latest brands including Fuji film, Nikon, Kodak, Konica-Minolta, Canon, Sony etc. The Software recovers lost digital photos, images and other files from all major USB removable media and fixed hard disk drive. 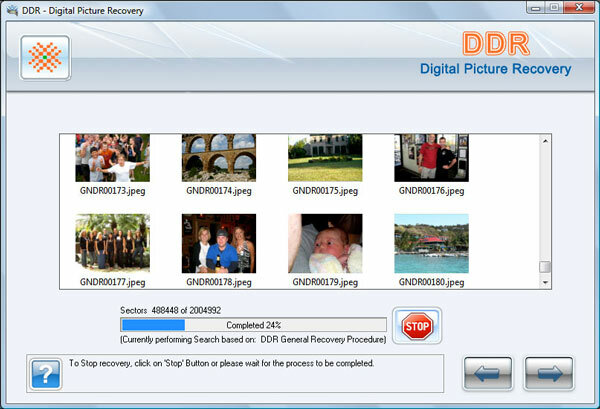 Easy and safe to use and does not require any prior technical skills to operate the digital picture recovery software.